Rhubarb is a hardy perennial in the buckwheat family (Polygonaceae). There are many species of plants called rhubarb (and not all are botanically related to the edible type). 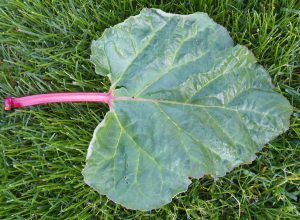 The edible garden rhubarb, Rheum rhabarbarum, is also sometimes referred to as R. xhybridum or R. xcultorum, and the name R. rhaponticum (European rhubarb, a different species) is sometimes misapplied. The ancient Chinese used it as a medicinal herb over 5,000 years ago. Native to southern Siberia, it got its name from the Russians who grew it along the Rha river (now the Volga). For centuries it was traded alongside tea as a cure for stomach aches and fevers. The large, heart-shaped leaf blades are held on thick colorful petioles. The English were the first to eat rhubarb, beginning in the 17th century, but unfortunately chose to begin with the leaves that look like chard. The leaves, however, contain a toxic amount of oxalic acid and are poisonous. The ensuing cramps, nausea and sometimes death from ingestion suppressed interest in the plant for about two hundred years. But by the late 18th century Europeans had discovered that the tart stalks were the part to eat – perfect for “tarts” giving rise to the nickname “pieplant.” It was brought to the Americas by settlers before 1800. This herbaceous perennial grows 2 to 4 feet tall with large, smooth, heart-shaped basal leaves. The plant grows from large, fleshy reddish-brown rhizomes with yellow interiors. The leaves emerge from crown buds when temperatures begin to exceed 40ºF in early spring. The thick, succulent red or green leafstalks (petioles) grow up to 18 inches long and 1-2 inches in diameter, with leaf blades up to a foot or more in width. The foliage dies back to the ground each winter. The crown buds beging to swell in early spring (L) and tightly folded leaves emerge (LC and C) to expand (RC) until the heart-shaped blades are smooth (R). The hollow flower stalks emerge in summer directly from the crown with a few small, sessile leaves along the length. Each branched inflorescence has hundreds of small white flowers, each with six tepals and usually nine stamens with yellow or pinkish green, elliptical anthers, and three styles. The flowers are followed by dry, three-sided fruits (achenes) with winged sides which do not split open when ripe. Flower stalks (R) emerge from the crown (L), with buds (2 LC) opening to branched inflorescences (RC) with hundreds of small white flowers (RC). The bold, architectural leaves of rhubarb make a good contrast with many perennials with fine and medium textured foliage. 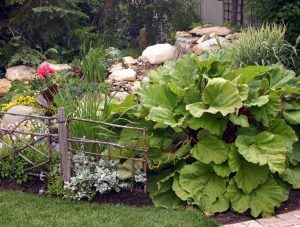 Although usually relegated to the vegetable garden, the large leaves of rhubarb can make a bold statement in a sunny flower bed (there are many ornamental Rheum species as well) and is a great way to incorporate an edible plant into an ornamental planting. The big leaves provide coarse texture that contrasts nicely with other plants with fine or medium-textured foliage. Try combining rhubarb with ‘Husker Red’ penstemon, tall garden phlox, ornamental grasses, or tall bearded iris. Rhubarb is very easy to grow. The plants like rich, well-drained soil high in organic matter, but are somewhat adaptable. Lighter soils will produce an earlier crop but require more irrigation and fertilization. Because this perennial will remain in the ground for several years, choose a site in full sun where it can remain undisturbed. Planting on raised beds for good drainage helps prevent crown rot. 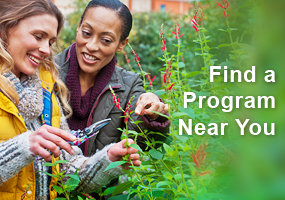 Prepare the planting site in the fall by eliminating perennial weeds and working in manure, compost or other organic matter. Incorporate fertilizer just before planting in the spring. 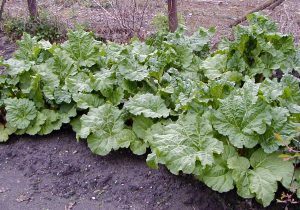 Rhubarb is easy to grow in soils rich in organic matter. Plant purchased crown pieces or divisions from other plantings about 3 feet apart. Set the pieces so the buds are about 2 inches below the soil surface. Don’t harvest any stalks the first year; wait until the second or third year so the roots can establish themselves. Fertilize established plants in the spring after growth starts and again in the summer after harvest. Maintain adequate soil moisture after the harvest season and remove flower stalks when they first appear to keep the leaves growing strongly. Keep grass and other competitors away from rhubarb. You may want to mulch in winter (after the ground freezes) to avoid heaving. 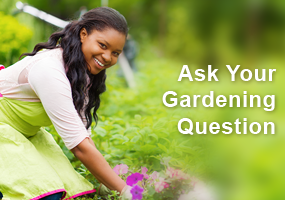 Well-maintained plants have few pests. Slugs may be a problem in moist areas, and crown rot may affect old clumps. Avoid crown rot by dividing clumps before they get too large. Leaf spots generally do not affect yield. Divide and reset plants about every fourth or fifth year to keep the plants vigorous. Rhubarb is best propagated by divisions taken in early spring. Although rhubarb can be grown from seed, it is generally propagated by divisions taken in spring, about 4 to 6 weeks before the average date of last frost. Use a sharp spade or shovel to cut up the crown into pieces, with at least one strong bud for each piece. Instead of digging up the entire plant to divide it, you can just leave a portion with 3 to 4 buds undisturbed in the old location, and remove the remainder. Rhubarb varieties are classified as red, green, or speckled (pink). Most people prefer the red stalked types, although the green ones are generally more productive. Red stemmed types are not necessarily sweeter because color and sweetness are not always related. In many cases, the same variety has acquired different names in different areas, as the plants get moved around, or with color variations, particularly for types grown from seed. Un-named “heirloom” plants from backyards or abandoned farmsteads can be equally productive and delicious. ‘Canada Red’ often produces shorter, more slender stalks than other varieties, but is tender and very sweet with good red color. It tends to produce few seed stalks. ‘Cherry Red’ (also known as ‘Cherry’ or ‘Early Cherry’) has long, thick stalks that are a rich red inside and out. This vigorous producer is juicy, tender and sweet. ‘Crimson Red’ (also called ‘Crimson’, ‘Crimson Cherry’, or ‘Crimson Wine’) produces tall, plump, brightly colored red stalks. ‘MacDonald’ produces well and has tender skin on the brilliant red stalks. ‘Valentine’ has broad, deep red stalks that retain a good rosy color when cooked. It is much less acid than green stalked and other red varieties, and produces few or no seed stalks. ‘Victoria’ is a speckled type that produces medium-sized stalks of excellent quality and good flavor. Although there is some variation in stalk color depending on the strain, in general the light green stalks develop pink speckling, especially at the bottom of the stalk. Rhubarb for sale at a Farmer’s Market. Rhubarb is typically used for jam, simmered into a sauce, or in pies or other desserts, but it also works well as an accompaniment to savory foods. It also blends well with other fruits in preserves and baked goods. Because rhubarb is tart it almost always needs to have sugar added to make it palatable. Rhubarb is most tender and flavorful in spring and early summer, but can be used throughout the season. Select firm, crisp stalks when they are 8 to 15 inches long. To harvest, twist off the leaf stalk at the soil line and cut off the leaf. Do not harvest more than a third of the leaves in any year to keep the plant going strong (and don’t pull any leaves during the first year of growth). On young plants, pick stalks only in the spring and allow them grow unpicked all summer or growth will be delayed the following spring. You can harvest sparingly on vigorous, well-established plants throughout the summer. Any leaves remaining at the end of the season can be pulled just before the first fall frost. Store fresh rhubarb stalks unwashed in the refrigerator for up to two weeks. Rhubarb can also be sliced and frozen, with or without sugar. It will keep it the freezer for up to 6 months. Thanks for this article. It reminded me to put compost on the rhubarb bed in the spring. 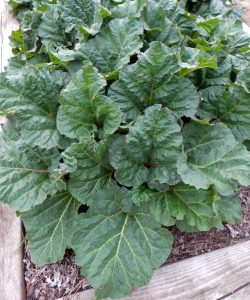 I’ve had some issues with the health of my rhubarb plants and this article provided some useful care tips which I will incorporate into my gardening practices. My rhubarb follows me from our home farm. It is most helpful to know more about the care needed. I know that my Dad always fertilized wth manure water at least once a year. Oh my I don’t have any of that – oh well. I did not know I should reset and divide the plants to keep them vigorous. Thanks for the information. Have had pie plant my entire life! Recently started sharing “starts” with others to keep the patch going. I know spring has arrived when I start seeing rhubarb push up through the ground. I have Canadian Red in my garden and Love it! Love Rhubarb. My grandparents and mother grew it and my mother left me several recipes. I have some now. I have four large rhubarb plants in my garden. The information on how to divide them is helpful, because they need it. I have a couple of old rhubarb plants in my inherited vegetable garden. It comes up every spring and just sits there as I have been warned that part of it is poisonous. This article is making me more bold, and I will definitely tend and harvest it next spring according to the suggestions given here. I’ve grown rhubarb for almost 40 years. It’s one of the easiest and most prolific plants to grow in Southeast Wisconsin, but in my sandy Northeast Wisconsin plot, it really could use more fertilizer and soil amendment (the deer like to eat it too). I never thought of different colors being different varieties. I’m only familiar with the red stemmed type! Is burdock related? The Italians call is carduna, which I see is its higher classification. That is also edible and completely green; my son used to collect it on the golf course in the spring! I didn’t realize rhubarb came in different colors – always thought it was red. The information on storage was useful, especially that it could be kept in refrigerator for two weeks. I didn’t know you should fertilize rhubarb in spring after growth starts and in summer after harvest. I have two vigorous rhubarb plants that are now 3 years old. I needed to move them after the first year, but they are robust and appear healthy. I had read that the twist and pull method is preferred, however I am usually so busy in the spring to actually harvest and use the rhubarb-it has remained ornamental. I will try to have some recipes ready for next spring. I found Japanese beetles eat leaves. For some reason the lower leaves all seem to be dying off mid August. It’s a 2 year old plant. I always look forward to the time when my rhubarb is ready for harvesting. One clump was divided in the spring from a friend and was very surprised at the size of the root – it looked like a large carrot. There are so many ways to prepare rhubarb, it’s hard to tell how much to cut for a recipe so it helps that it has a long storage life when refrigerated. Each of my four plants have different stalks, some much larger than others and the colors differ. 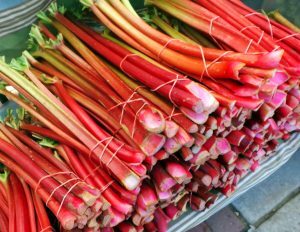 I stop using rhubarb by July 1st and am always surprised that some farmer market vendors will still be selling rhubarb at the end of July. I love this first fruit of the season plant, but my patch was starting to become less vigorous in its very sandy soil location. I will definitely dress my plants with compost. I always pulled the stalks when harvesting rather than cutting. However, I have not followed the suggestion to harvest only one third of a plant in any given year from here on in. Will also try splitting some of my older plants to help regenerate my bed. As my family has grown older, I have harvested less from my rhubarb plants. The plants have become less robust so I thought the lack of harvesting was the issue. From this article I learned that the plants need to be divided every 4 – 5 years to keep them strong! I will be doing this when it stops raining outside. Pulling stalks out of the ground is the correct way to harvest your rhubarb. Failure to do that will eventually will kill your plant. Don’t worry, you won’t pull out the roots. I have a Joys of Rhubarb cook book that I love trying new recipes ! Great refresher on Rhubarb. I am awaiting a plant to put in this spring. This will be my first rhubarb planting that doesn’t come from a friends plant division. Fingers crossed! I have a delicious frozen jam recipe that mixes pineapple with the rhubarb. I make 12 large jam jars each spring that carries me to the next season. I never thought of adding rhubarb to my perennial garden and have just the spot amongst my Husker Red penstemon and little bluestem. Great suggestion! I always have cut off the stalks but my neighbor does the twist and pull method. I will try that this spring/summer …can’t wait! I always cut the stalks too. I would worry about pulling out roots with twisting. Will see. Never considered Rhubarb for landscaping. I will now. Good article with a lot of useful information. Good to know rhubarb can be divided in spring. I wasn’t sure about that. My rhubarb is being moved this spring to share with family and to get it away from encroaching shade from a basswood tree. Interesting to know that the red rhubarb is not necessarily sweeter than the green. I just checked the old plant in my backyard (early April Dodge County) and can see a few reddish-brown crown buds trying to emerge. Very informative article. I had never grown rhubarb but it was here when we bought our place. I was always harvesting all of the stalks, which I have no learned is wrong. It may be the reason that after 5 years of doing this my plants are getting weaker and not producing as much. I will be more careful in the future to only harvest 1/3 of the stalks. And I will probably not harvest any this year, hoping to let them become more hardy again. 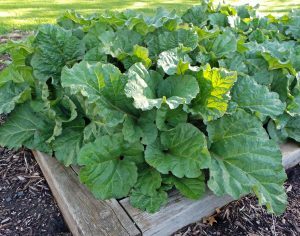 Caprice, this fall, get some compost or well rotted manure and pile it on the top of the plants…they are heavy feeders, and this will help them recover from over picking….I so love rhubarb. 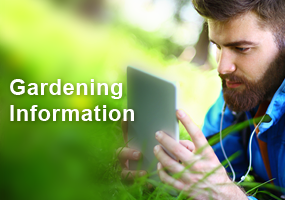 Gardening is a learning experience. !!! Great information! I did not realize it was part of the buckwheat family. I’ll be acquiring a division from my neighbor & pleased to see the division should be so soon in spring. Can’t wait to bake pies etc for the family!